New York - In the ‘City that never Sleeps’, Saint Patrick’s Day and fist-fighting is an annual tradition. Top Rank Boxing and it’s media partner ESPN held a special Saint Patrick’s Day night of fights at The Hulu Theater of Madison Square Garden in Midtown Manhattan. First off the national broadcast is a six round bantamweight bout between a fighter nicknamed as “The Leprechaun” - Belfast’s Paddy Barnes (5-1, 1 KOs) and Oscar Mojica (11-5-1, 1 KO) of Dallas, Texas. Barnes the fan and pre-fight favorite and a two-time Olympic bronze medalist from Ireland suffered a Split Decision defeat versus Mojica. Mojica earned two scores of 58-56 to secure the win and improved to 12 wins. Barnes won in one of the three judges’ cards with the same score. The Irishman was bloodied early in the contest and figured in a crowd-pleasing battle versus Mojica. Both fighters went to the body early and fought heavily in the inside to the delight of the fans. Mojica’s strong punches prevailed as he hurt Barnes a couple of times in the fight. He mixed head and body shots that bothered the Olympian. Barnes did not go down from his opponent’s fists (him kneeling in the 2nd was ruled a push by the referee) but fought courageously despite blood dripping from his nose throughout the fight. He was successful upstairs with his head shots but they don’t seem to affect Mojica who kept pressing him. The luck of the Irish was not with Barnes tonight as he suffered loss number 2 of his young professional career. 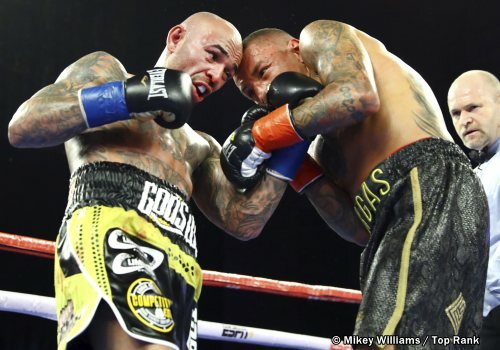 Former welterweight champion (World Boxing Association) Luis Collazo (38-7, 20 KOs) triumphed with a hard-earned Split Decision nod over Samuel Vargas (30-4-2, 14 KOs) in the main event of the night. 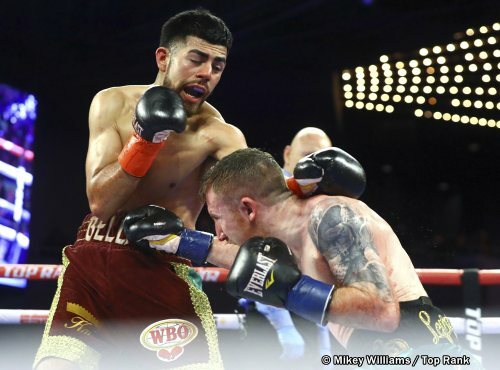 Collazo earned two favorable scores of 96-94, 98-92 while losing 94-96 in one card to make himself relevant in the highly competitive 147 pound division. The veteran fighter from nearby Brooklyn, fought hard in the inside against a game Vargas who never backed down from him. Collazo, 37, suffered cuts in both of his eyes during the course of the bout but his tenaciousness paid off against his younger foe. He met Vargas’ advances in the ring head-on and fought a bloody battle that earned him his 39th victory despite a cut on his right eye in the 2nd round. Vargas, 29, of Bogota, Colombia was aggressive and tough, he covered Collazo with a mix of head and body punches and gave the former welterweight champ a hard night as evidenced by the bleeding and bruising in Collazo’s face. Collazo put his ring experience to good use versus Vargas. He boxed and moved beautifully in the 7th and scored well-placed shots in the face of Vargas. He suffered another cut in the 7th, this time in his left eye but that did not deter him in gaining another win- his 39th. 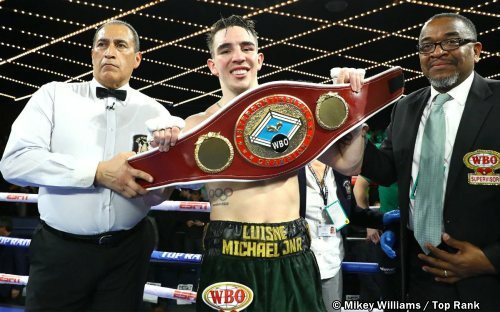 In the third and final offering of the the national broadcast, Ireland’s Michael Conlan (10-0, 6 KOs) defeated Ruben Garcia Hernandez (24-3-2, 10 KOs) of Cancun, Mexico via an eight-round Unanimous Decision to close the show from the small theater of MSG. 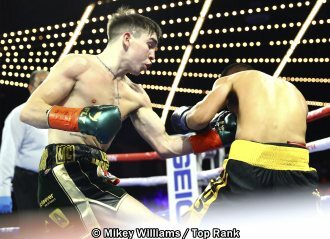 Conlan delighted the predominantly Irish crowd with superb boxing and accurate punching against his Mexican counterpart and earned perfect scores of 100 to 90 in all of the three judges at ringside. The 2012 Olympic bronze medalist at flyweight jabbed, hooked and weaved out of danger against Hernandez. He moved smoothly with his feet and scored with his fists to remain unbeaten at 11-0. He maintained his World Boxing Organization (WBO) Intercontinental Featherweight title with his victory in front of his cheering Irish fans. You can reach the writer at rrmaze24@aol.com and @Freemazon910 on Twitter.